Google Play Gift Card: Get music, movies, TV shows, books, magazines and Android games and apps on Google Play. Enjoy your purchases on both the web and your Android phone/tablet. iTunes Gift Cards: When you give iTunes Gift Cards and iTunes Gifts to friends and family, they can choose whatever they want on the iTunes Store, App Store, iBooks Store, and Mac App Store. Microsoft Xbox Gift Card: for games and entertainment on Xbox or Windows. Buy the latest games, map packs, music, movies, TV shows and more. * And on Xbox One, buy and download full blockbuster games the day they’re available everywhere. Great as a gift, allowance, or credit card alternative. Sony PlayStation Network Card: PlayStation Network Codes fill your PSN Wallet with cash, allowing you to download new games, DLC, and videos, as well as stream movies and music. Facebook Gift Cards are the quick and easy way to get items in your favorite games and apps on Facebook like Candy Crush Saga, FarmVille 2 and DoubleDown Casino. Whether you’re looking to speed up your progress or play more games with friends, the Facebook gift card works across thousands of games on Facebook. Pick up a card for yourself or give one to a friend and share the fun! Microsoft Windows Store Gift Card is a fun gift for any special occasion. It serves as valid currency at the Windows, Windows Phone and select Xbox stores. 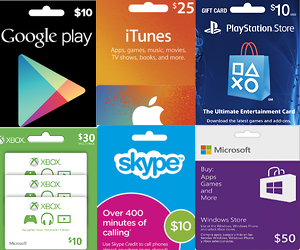 With this gift card, users can easily purchase and download apps, games and add-ons to enhance their gaming or smartphone experience. The code for the Microsoft gift card arrives via email delivery, putting it right at their fingertips. It is also a smart choice as an allowance or the occasional gift for your kids who use a Windows phone, Xbox gaming system or other Microsoft products.